Who had the most interesting chassis at Computex 2013? 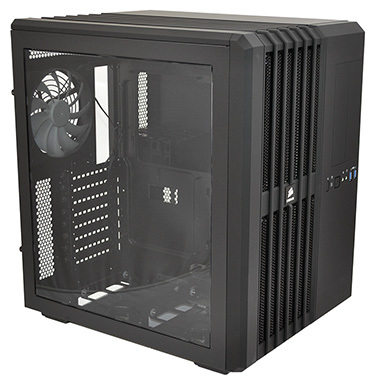 Our vote would go to Corsair and the intriguing, double-width Carbide Series Air 540. Heck, we'd go as far as to say this is arguably the most intriguing chassis Corsair has produced in recent years. You see, we get to play with our fair share of chassis in the HEXUS labs, and if there's one thing we really appreciate it's something a little bit different. 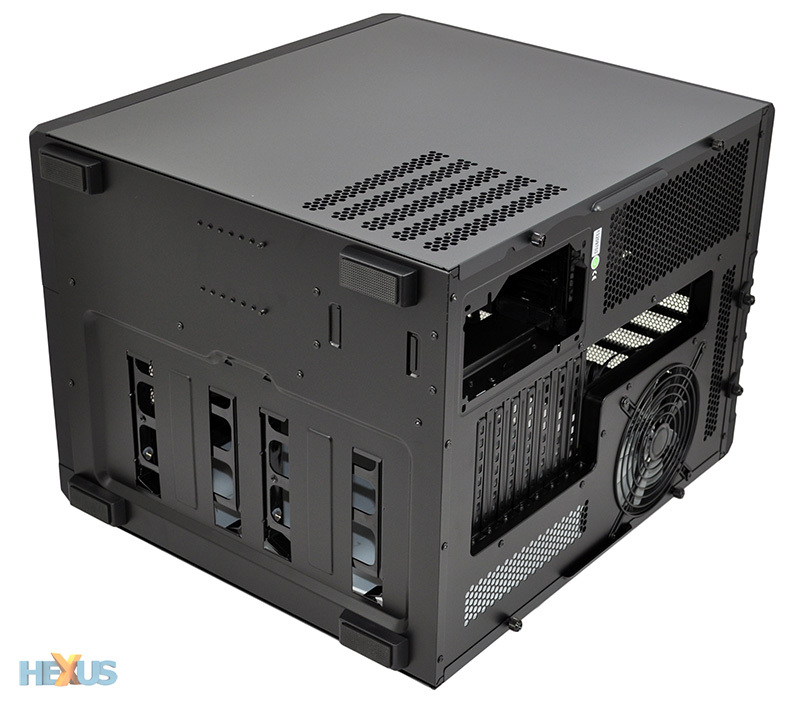 For that reason alone, the Carbide Air 540 is more fun to work with than the range-topping Obsidian 900D; a gargantuan solution that, while admittedly impressive, simply doesn't appeal to a wide range of customers. The Carbide Series Air 540 is a different kettle of fish entirely. 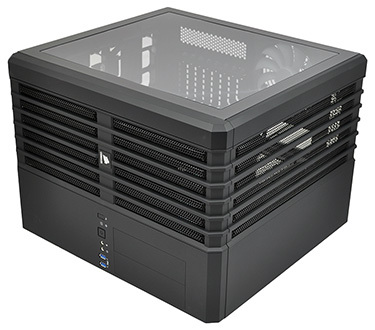 Scheduled to ship by the end of the month, Corsair's latest claims to be "the best air-cooling case in the world," despite standing less than half-a-metre tall, and with a price tag of around £115 it's within reach of most enthusiasts. So what's different? 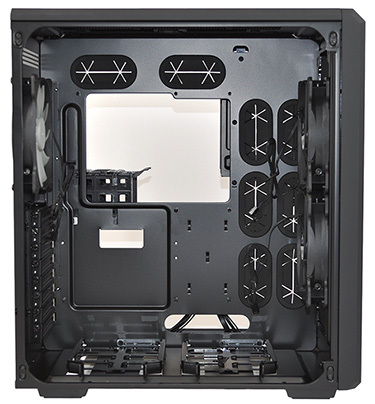 Well, in order to achieve this so-called best-in-class cooling, Corsair explored various avenues - including case rotations and adding more fans - but in the end found that one element mattered more than any other: clean, unrestricted airflow. The same theory applies to most chassis, however maintaining a clear path from front to back is easier said than done when you've multiple components to deal with. Getting around any such obstacles, the Air 540 is specifically designed to offer dual chambers; an actively-cooled main chamber on one side for all your hot-running components; and a passively-cooled second chamber on the other for, well, everything else. 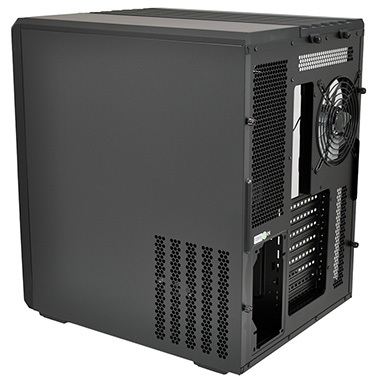 This two-sided approach is what gives the Air 540 a chunky, cube-like frame that measures 415mm x 332mm x 458mm in size. Short and stout is how we'd describe it, and while it's not the sexiest PC we've ever seen, it's surprisingly attractive in its own sort of way. Perhaps it's the fact that it looks different to most other enthusiast solutions, giving the Air 540 a fun and almost playful attraction. However don't be fooled into believing this to be a small, space-saving design. 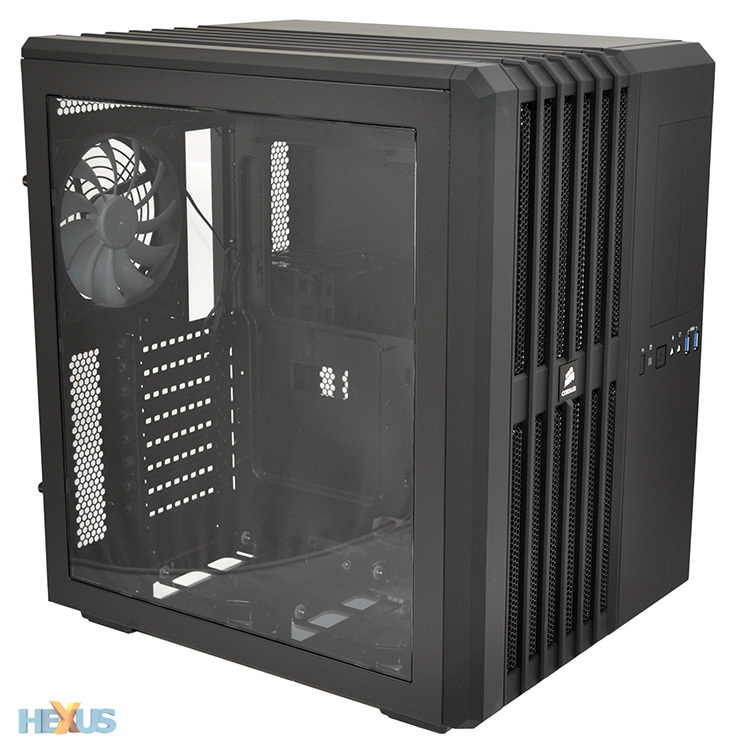 On the contrary, the Air 540 is actually taller than a Carbide Series 200R and almost twice as wide. It's the shorter depth that makes the chassis seem relatively compact, but what it lacks in length it more than makes up with width, ensuring plenty of overall volume. We're glad to see Corsair trying different things with its enclosures, but we see so much promise in the Air 540 that we almost wish the chassis had been fashioned as part of the high-end Obsidian line. As a price-focussed Carbide Series solution, the construction is a mix of steel and plastic, resulting in a light frame that's well put together but lacking panache. Making the Air 540 into an Obsidian would have no doubt increased the asking price, but we'd loved to have seen a bit of brushed aluminium and some 550D-like sound-proofing. On the other hand, while the plastic exterior isn't the pinnacle of sophistication, you could argue that chassis interiors don't come much better. It's worth noting that dual-chamber cubes aren't entirely new - the Air 540 takes a similar approach to the Cooler Master HAF XB - but credit where it's due, Corsair's implementation works particularly well. The main windowed chamber (pictured above, left) is designed to house a Mini-ITX, Micro-ATX, ATX or E-ATX motherboard, along with all your on-board components, any chassis fans and a pair of hot-swappable 2.5/3.5in storage devices. 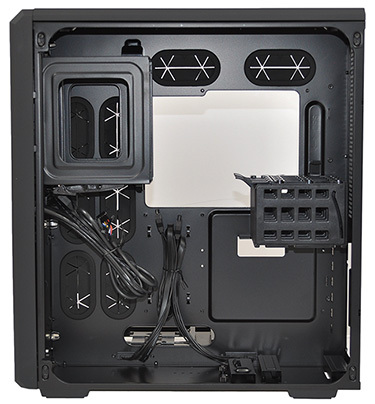 The second compartment (pictured above, right) has no active cooling and is used to store everything else; the PSU; a couple of 5.25in optical drives; up to four 2.5in SSDs; and, if it tickles your fancy, perhaps a reservoir or two.